You asked for it…we’re doing it!! Pick a Piece!! You can choose between a regular frame, a heart shaped frame, a rock, or (new this month!) a flower pot! 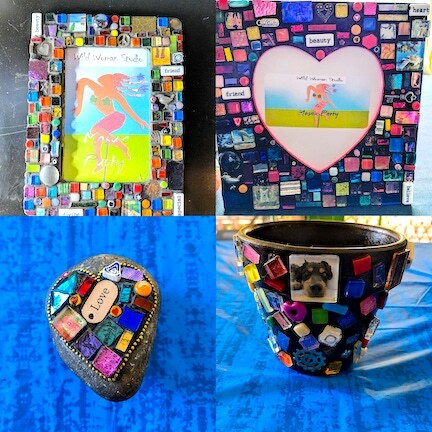 The cost is still only $40.00 which covers everything you need including a grouting kit to take home with you, plus a glass of wine and snacks! Party times are April 14 or April 27 from 1-3!. Contact me soon to reserve a spot. They will go fast!! Seating is limited to six people per party so they will fill up fast! Message Gina @ gmeyers1952@gmail.com for more information or to make reservations.